Eastbourne’s James Norwood was named as the Sky Bet League Two Player of the Season at the EFL Awards night. 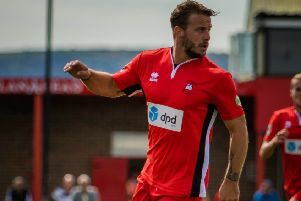 Tranmere Rovers striker Norwood, who started his career at Eastbourne Town, was selected ahead of Bury duo Danny Mayor and Jay O’Shea to the award. His 27 goals this campaign is seven ahead of his nearest rival and is even more impressive as it is his first season in the EFL. Norwood was also named in the EFL team of the season. He later tweeted, “What an unbelievable night, feeling very honoured to have won there awards and share the stage with some unbelievable footballers. The 28-year-old is out of contract at Tranmere this summer. He has been offered a new deal but could move on as a free agent. Ipswich, Burton Albion and Fleetwood Town are all reportedly interested in signing the leading goal-scorer in England’s top four divisions this season.